In the mid 1960s, there emerged around MIT's Cambridge campus a couple of guys doing stupid songs about student life. They went by the name of the Doormat Singers. Here are some remnants of those days. In an as yet unexplained development, two new recordings of Doormat Singers songs has been created by residents of East Campus. Stay tuned for futher developments, but listen while you have the chance. This may be a temporary aberration and could quickly disappear. Visit the East Campus Website for official information. Old East Campus - arranged and performed by Kimberly A. Dauber, '18. The Institute Screw - arranged and performed by Kimberly A. Dauber, '18. Proving conclusively that "with age comes wisdom" is a complete myth, the Doormat Singers made a live appearance -- the first in over 40 years -- on June 4, 2010 as part of the MIT Class of 1965 Reunion. 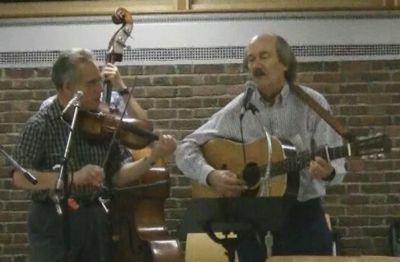 During the entire course of the evening, and despite the fact that the Doormat Singers performed every one of their old songs, no ambulances or police cruisers were summoned to Baker House. The event was therefore considered a success. As proof that this event really did occur and was not just a delusion, we include here visual and audible evidence salvaged from the Baker House dumpster mere moments before it was to be sent to the MIT incinerator. Items marked with "*" are Doormat Singers original songs from the 1960s; viewer discretion is advised. For history, lore, and four of the better-known songs, check out Dan Smith's original Doormat Singers site. An article from Broadside of Boston which includes the lyrics of one of the songs. Wikipedia notes the Doormat Singers as somewhere in the line of MIT students who wrote their own songs. 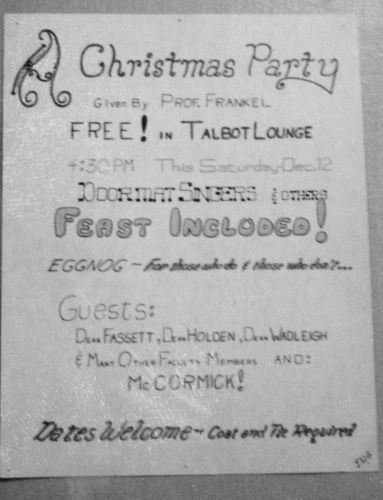 The Doormat Singers came into existence in the basement of Walker Memorial and were heard most often on WTBS Nite Owl. Following are some lesser known songs from a year or so later. Desolation Sigma. Probably the best of all the songs, but since it is based on Bob Dylan's "Desolation Row", that's not too surprising. Student Center. Noting the oddities of the newly-opened Julius A. Stratton Student Center. Boston Breakdown. Getting away from MIT a bit. 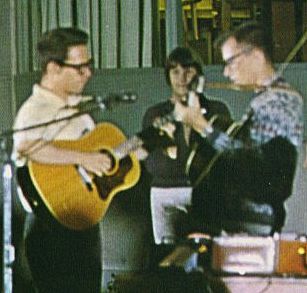 In addition, a recording was made of the Doormat Singers appearance at the All Tech Sing, March 20, 1965, in Kresge Auditorium. (Described in The Tech.) These versions became by far more commonly played. Included is the comment by Dean Fassett at the conclusion of the Doormat Singers performance, which nicely sums it up.